A 65-year-old male patient with nephrotic syndrome was admitted to our hospital due to worsening systemic edema and purpura on the limbs. He had an impaired renal function, low serum complement level, and elevated rheumatoid factor level. He was positive for cryoglobulin (monoclonal IgM-κ and polyclonal mixed-type IgG), and the results of his kidney biopsy showed a tissue profile of membranoproliferative glomerulonephritis (MPGN). Due to the fact that the secondary cause was unclear, he was diagnosed with MPGN due to essential mixed cryoglobulinemia. On hospital day 20, he was initiated on 50 mg/day prednisolone (PSL). On hospital day 43, oral mizoribine (MZR) at a dose of 150 mg/day was prescribed. On hospital day 49, cryofiltration was performed because the disease was steroid resistant. The treatment promptly decreased urine protein levels. Serum albumin and serum complement levels increased, and complete remission was achieved approximately three months after the initiation of treatment. The PSL and MZR doses were gradually reduced to 2 mg/day and 100 mg/day, respectively, without any reemergence of the symptoms of cryoglobulinemia or relapse of the nephrotic syndrome for three years. Here, we report this case with essential mixed cryoglobulinemia in whom we could achieve complete remission of the disease by adding cryofiltration to the oral corticosteroid and immunosuppressant therapy with mizoribine and could maintain for a long time. 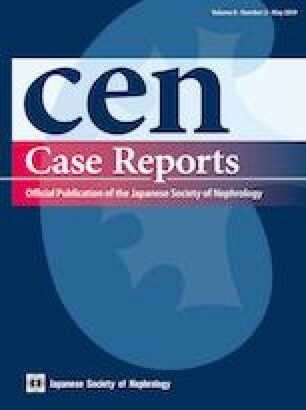 This case report was approved by the Institutional Ethics Committee of Kurume University School of Medicine (2017-045).